This creamy hand soap is enriched with sweet almond oil to gently cleanse and relieve dry skin, while leaving hands feeling soft and smooth. Creamy, soothing formula will leave hands beautifully smooth. Moisturizes and nourishes. 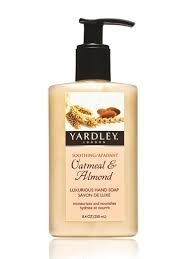 Nourish your skin with Yardley Soothing Oatmeal & Almond. This creamy hand soap is enriched with sweet almond oil to gently cleanse and relieve dry skin, while leaving hands soft and smooth. Not tested on animals. Made in USA. Water, Sodium Laureth Sulfate, Ammonium Lauryl Sulfate, Cocamidopropyl Betaine, Lauramide DEA, Glycol Stearate, Glycerin, PEG-7 Glyceryl Cocoate, PEG-150 Distearate, Fragrance, Triclosan, PEG-7-M, DMDM Hydantoin, Citric Acid, Tetrasodium EDTA, Sodium Chloride, Yellow 6.